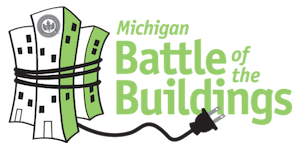 The Michigan Battle of the Buildings is an awards and recognition program for energy use reduction open to all Michigan area commercial, industrial & multi-family buildings. The program is a way to encourage energy-efficient practices in buildings across the state and to instill a spirit of friendly competition among the area’s building owners and operators. There is no cost to enter the competition. Registration period runs January 1 through March 31 each year. WHAT DO BATTLE CONTESTANTS HAVE TO SAY ABOUT THE COMPETITION? Improved energy efficiency can decrease operating expenses and increase property asset value. For example, a 10% decrease in energy use can result to a 1.5% increase in net operating income. The Michigan Battle of the Buildings program hosts education & networking events throughout the year with the goal of connecting building owners & operators to the rapidly changing resources available in energy conservation. Your participation will help Michigan be recognized as a community that takes an active approach in ending the war against climate change. Let’s have a good time! Sign up to make sure you get all the event announcements. Saving energy is cause for celebration! We've got a lot of great stuff to share with you. Get news about Battle of the Buildings conveniently delivered to your inbox.